Using our high temperature thermoplastic expertise, Tri-Mack designs and builds injection mold tooling. In-house tool making capabilities provide our customers with a single source for injection molding projects and enables us to reduce the lead times for new product introductions. 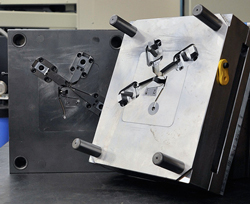 With molding and tool making in the same facility, mold modifications and maintenance happen quickly and efficiently. Tri-Mack uses SolidWorks and Cimatron CAD software to design tooling. MoldFlow analysis enables us to optimize the tool design for the molding of the highest quality parts. Tri-Mack’s fully-equipped tool room builds injection molds using state-of-the-art CNC equipment, including CNC sinker and wire EDMs. Our precision molds are built for high temperature engineering plastics using hardened steels and electric or oil heat as required. The same expertise is also used to build precision machining and inspection fixtures. We often build family molds that share common components while producing multiple part numbers, reducing the tooling cost. Depending on the complexity and tolerance requirements, we build tooling that mold near-net shapes. Instead of investing heavily in complex tooling, some projects benefit from simple molded shapes that rely on efficient secondary machining operations to finish tight tolerances and complex features. This is also a cost-effective approach when dealing with low volume components. Tri-Mack tool making also provides high precision injection mold tooling that can yield intricate mold-to-finish geometry and tight tolerances.